The name of the monastery, Valvanera, comes from a Latin expression, “Vallis Venaria” which means " “Valley of the veins of water" since the valley had lots of springs, streams and waterfalls.. The origin of the building of the shrine dates back to the discovery of a 9th-century image of Saint Mary by a repentant thief called Nuño Oñez, according to the “Historia Latina” written by the Abbot of Valvanera, Don Rodrigo de Castroviejo in 1419. It is the Latin translation of a 13th century text possibly written by Gonzalo de Berceo in the "vulgar mother" tongue. The primitive community of hermit monks which built up around the discovery of the image in the 10th c. gave way to Benedictine friars. Originally, there was a Visigoth church, then a Pre-Romanesque one consecrated in 1073, another Romanesque one from 1183 of which only a tower remains standing, and finally the current 15th century church. The main altar of the church holds the niche of the Virgin of Valvanera, which can be reached from the side. The upper part is presided over by a “Pantocrator” figure of Christ, and below there are figures representing St Peter, St Paul, St Benedict and St Atanasio. 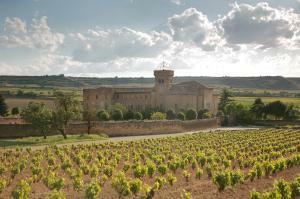 The rest of the monastery is composed of 20th century buildings in honour of the Patron Saint of La Rioja. Homage is paid to Valvanera as the most important carving. The author and date of this work are unknown, but from its characteristics, it could be a sculpture in the Byzantine-Visigoth style. Its origin comes from the context of the renewed Marian fervour in Spain in the first half of the ninth century. Situated outside the city, in the spot where according to tradition the Virgin of Vico appeared to the Kan of Vico, leader of one of the Arab communities in Arnedo, in the year 1045. It was in 1456 when the Franciscano Fray López de Salinas founded the monastery which enjoyed its greatest splendour in the 17th century. The monastery had a valuable library of which little has survived. The reason for its loss were the two fires which occurred in the building in 1635 and 1766. Nowadays it is occupied and run by sisters of the Cistercian Order. This order lives a life of contemplation, prayer and liturgy, although for their maintenance they work in the decoration of porcelain, making cakes and lodging guests. 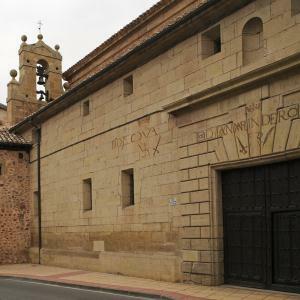 This convent was founded in 1598 in Calahorra with barefoot nuns of the Order of Our Lady of Mount Carmel. Many were the people who supported the construction of its church, which was consecrated in the year 1642, among whom we should mention the Bishop of Calahorra y La Calzada, Pedro Manso de Zúñiga and the head of the Patronazgo, José González de Uzqueta. The façade of the church has a typical Carmelite rectangle crowned by a triangular top with balls. Over the main doorway is a stone image of San José with the infant from 1649 which comes from Madrid, with eagles on either side holding the arms of the González de Uzqueta family. The main altar is in the classic style from the first half of the 17th century, in the centre of the body, a group of sculptures of the Trinity and Holy Family in the Castilian style of the school of Gregorio Fernández. In the side panels and attic, paintings of the life of Santa Teresa. In the side altarpiece, on the left you can admire an extraordinary carving of Christ tied to a column, by Gregorio Fernández from 1625 and an oil painting of Jesus Saviour of the World. In the central nave there are two neo-gothic altarpieces with the images of Saint Teresa de Jesús on the right hand side and the Holy Family on the left. In the southern arm of the transept a 1644 painting by Bartolomé Román depicting the martyrdom of St. Bartholomew and in the lower choir, a magnificent Romanist crucifix from the late 16th c., by the Portuguese sculptor Manuel Pereira. The monastery has lodging with a spacious inner patio. The Carmelite nuns who live here make exquisite sweets and confectionery in the monastic tradition. The monastery has accommodation with a large inner patio. The Carmelite nuns who live there make delicious monastic cakes and sweets. 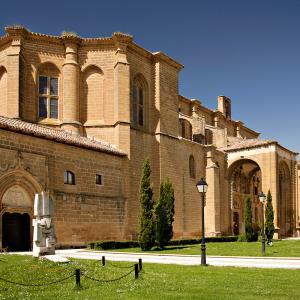 This Cistercian Abbey is one of the first to have been founded in Spain. Felipe Díaz de Haro, 9th Lord of Biscay and his wife, doña Aldonza Ruiz de Castro in 1170 gave the towns of Cañas and Canillas to the nuns of the monastery of Hayuela for them to found an Abbey in this spot. The monastery church surprises you with its light through the large windows. The great Renaissance altarpiece is the work of Andrés de Melgar and Guillén de Holanda, commissioned by the Abbess, doña Leonor de Osorio around 1523 as a triptych, in which the theme is essentially based on Mary. Until 1975 it was in the presbytery, but is now to be seen at the foot of the church. The doorway of the chapter house is of note for its unusual beauty, with three pointed arches decorated with plant motifs. Inside, is the early 14th c., gothic style tomb of the sister of charity, Doña Urraca López de Haro, daughter of the founders who took orders at a very early age and became the fourth abbess of the community. She died in 1262, and her body has been preserved incorrupt. The abbey has been a pioneer of fibre optics, in the two museums it has: the Relics Room, which contains four groups of collections dating from the year the monastery was founded until the 20th c. among the numerous items on display, a Spanish Moorish casket from the 11th and 12th centuries of Cordoban origin is of note; and the museum of the tithe barn or store, in which various altarpieces have been displayed which existed n the churches, carvings, reliefs and paintings of special interest. The community of Cistercian nuns who have lived uninterruptedly in the abbey since its foundation devote their time to handicrafts and prayer. They decorate china, make sweets, rosaries and have a small hospice. The Bishop of Calahorra y La Calzada, Don Juan Fernández de Velasco and his niece, Doña Isabel Alonso de Guzmán y Fernández de Velasco were its founders. The young girl entered the monastery taking the name Sister María de La Piedad and her uncorrupted body is still kept there. Cardinal Adriano Florenz was asked to bless and inaugurate the monastery in 1522 on the occasion of his visit to the “Casa de la Reina”, the town's old name, on his way to Rome where he was going to be confirmed and enthroned as Pope under the name of Adrian VI. The sisters of the Dominican Order took possession of the monastery in 1523, although during the war of Independence they had to move to Burgos as the monastery had become a Field Hospital. The monastery took ten years to be completed (1514-1524), using materials of the highest quality, thus obtaining great uniformity of style. The monastery church is in "Catholic Monarch" style, with a big main chapel and octagonal transept and apse. In the centre of the nave is the tomb of the founder, a smooth reddish jasper mound with no other decoration except the inscription. The reredos is dedicated to the Passion of Our Lord and particularly the Pity. >The main cloister has two levels, the lower covered with tierceron cross vaulting. The central keystones of the vaults depict allegories of the Passion with various symbols and attributes. The upper cloister, covered with a flat wooden roof, and with stretches of balusters between the columns, is one of the parts with the richest ornamental decoration. The main door of the church is conceived in the late Gothic style in the form of a big altarpiece mad of stone. Doña Aldonza Manrique de Lara, daughter of the Dukes of Nájera founded the monastery in the mid 16th c., outside the city. Nothing remains of this building and the current complex consists in church, cloister and other monastery buildings inside the cloister. The monastery church is the only part open to visitors. It dates from the 17 th century and is the work of the stonemasons Pedro Ezquerra de Rozas and José de la Puente Liermo. Strung along the nave you can see various altarpieces of great beauty, two of them in Rococo style in the arms of the transept, one of them with the image of the Conception from the mid 17th c., and the other with that of Santa Clara. The main altarpiece in baroque style is made up of a base, a single block of three vertical series of panels and top piece, the work of Mateo Rubalcaba, in the centre of the body is a fine carving of Santa Elena. Wrought iron railings at the foot of the church composed of two parts dating from 1660 separate the part open to the public from the closed order where nowadays the Franciscan Clarisa nuns live. The monastery was founded by king García Sánchez III “the one from Nájera” and his wife Doña Estafanía de Foix who commissioned its construction in 1052. The origin of its foundation are misted in the legend which tells how the king was out hunting and chased his prey into a cave where he found a mysterious image of the Virgin and a jar of lilies, a bell and a lantern. Some time later the king reconquered the Lower Rioja city of Calahorra from the Moors and built the monastery of Santa María La Real as an offering to the Virgin for her help. At the same time he set up a Military Order of the Knights of the Terrace or of the Jug, one of the most ancient orders in Spain. In 1079 Alfonso VI of Castile incorporated the monastery into the Benedictine order of Cluny together with the group of clergy who lived in it from its creation and who remained until the disendowment of Mendizábal in 1835. Since 1895 a community of Franciscan friars have run the monastery. The altarpiece of the main chapel dates from the late 17th c. and is Baroque in style.In the centre the Romanesque carving of Santa María La Real holding the infant Christ on her left knee is of outstanding interest. The early 16th c. choir is in "Catholic Monarch" style and here you can see the influence of the late Gothic and early Renaissance era. The carved choirstalls in walnut are a masterpiece of florid Gothic. In the abbot's throne we can admire the polychrome figure of King Don García. The cloister was begun in the early 16th c., known as the Cloister of the Knights, was for centuries the burial place of many nobles. Among them we should mention Diego López de Haro with a recumbent sculpture from the 13th c. and at his feet, the Gothic tomb of his wife, Doña Toda Pérez de Azagra. The harmonious mixture of styles such as the florid Gothic of the vaulting and the Plateresque of the tracery arches have created a surprising work of architecture well worth a visit. The monastery of La Estrella was built on the foundations of an old shrine built as a result of the appearance of an image of the Virgin Mary on an oak tree. This monastery was originally called Our Lady of Aritzeta (Holm Oak in Basque) and later “Estrella” (the Star) because the oak tree in which the image of the virgin appeared had this symbol engraved on one of its branches. In 1403 Juan de Guzmán, Bishop of Calahorra y La Calzada, gave custody over the shrine and its lands to the Hieronymite friars of the Morcuera (Miranda de Ebro). Following Martin V's Papal Bull, (1419) it was made a monastery. The Archdean of the Diocese of Calahorra y La Calzada, Diego Fernández de Entrena in 1423 paid for the reconstruction of the monastery in line with the style of the era. The painter Juan Fernández de Navarrete “El Mudo” from Logroño, started to train in this monastery in which he left works executed by his hand which no longer exist today. In 1951 the Brothers of the Christian Schools, Hermanos de La Salle, acquired the monastery and rebuilt it on the ruins almost all in the neo-gothic style, under the direction of the architect Pedro Ispizua, perfectly harmonized by the new style of ancient structures. At the present time, several parts can be visited: the Knights' Gate, which was the main doorway, the Gothic cloister of 1430, the 16th century King's Fountain, the modern sanctuary from the mid 20th century, the pilgrims' hall, and the tomb of the Archdean. San Millán de la Cogolla is how this site made up of a village and the two monasteries is known, which has its roots in the community which grew up around the work of the hermit monk named Millán who lived 101 years (473-574) in caves in the sierra de la Demanda devoted to prayer. Suso from the Latin sursum means “at the top”, as the older of the monasteries is known, and Yuso, from the Latin deorsum, “at the bottom”. In 1997, they were both declared World Heritage Sites by UNESCO. Of the current Monastery of Suso, constructed between the 6th and 11th centuries, important vestiges remain of the different historic moments it has lived through. The rock caverns in which the hermits lived, the primitive Visigoth coenobium, the Mozarab enlargement and finally, the Romanesque. Access to the monastery is through the portaello, where the tombs of the infantes de Lara and their tutor Nuño are located, accompanying the three Navarran queens. Through the Mozarabic arch with alabaster capitals which recall the time of the caliph of Cordoba in the 10th c., decorated with designs depicting plant motifs and geometrical shapes, we enter inside the Mozarabic monastery with three large horseshoe arches. At the back we can see the remains of the primitive Visigoth construction. The burial cave contains the tomb of the founder from the second half of the 12th c. built of black alabaster and decorated with a recumbent statue, wearing priest's robes, alb, chasuble and stole with a beautifully worked cross on his chest bearing the decoration of numbers and plants. Nowadays, the Pilgrims' Way as it passes through la Rioja makes a diversion to the monastery of Yuso where the saint's remains are kept. The origin of the construction of this monastery is reflected in a legend which tells how king García of Nájera, ordered the transfer of the remains of San Millán which were then in Suso to the Monastery of Santa María La Real de Nájera. The oxen which were pulling the cart stopped in the valley as if the Saint's remains did not want to abandon it, so the current monastery of Yuso was constructed on the spot. A 10th-11th century Romanesque monastery of which today no trace remains, over which the current monastery of Yuso was constructed between the 16th and 18th centuries by the Benedictine abbots. The Benedictine monks moved to the monastery in the 10th century. One of the most notable abbots was Domingo, born in the Riojan village of Cañas, better known as Santo Domingo de Silos. The main door to the monastery was built in 1661 and depicts the relief of San Millán “Moorslayer” since, according to tradition, he fought against Islam together with Santiago (St James) in the battle of Simancas. The vestibule was made later, in 1689, and together these lead into the Kings' Chamber, called thus because of the four large canvases of kings who supported the monastery. The low cloister was begun in 1549 and although its vaults are gothic in conception, it is Renaissance. Outside it is classicist in style and it houses twenty-four paintings by José Vexes, whose main theme is the life of San Millán, written by San Braulio, Archbishop of Zaragoza. The vestry is one of the loveliest in Spain, the former chapter house started to be used as such around 1693. The 18th century frescos on the ceiling conserve all the rich original colour in spite of never having been restored. The walnut drawers and chests, over which hang twenty-four oils painted on copper in the Baroque style originating in Flanders, Madrid and Italy. The monastery church was the first part of the whole to be completed, begun in 1504 and finished thirty-six years later. It is catalogued as being "decadent gothic". The grandiose altarpiece of the main altar has a canvas by Fray Juan Ricci, of the school of El Greco, depicting San Millán on horseback and the battle of Hacinas . The extraordinary wrought ironwork of Sebastián de Medina from 1676 complete the artistic whole of the main chapel. The lower choirstalls were decorated by a Flemish sculptor around 1640, the retro choir in French Rococo style is decorated with busts depicting the disciples of San Millán, with the plateresque pulpit with reliefs of the writers of the gospels and symbols of the passion. The upper choir, somewhat later than the lower one, is supported on an arch with sixteen medallions, from the first half of the 17th c.
The shelves for the monastery songbooks hold twenty-five volumes copied between 1729 and 1731. 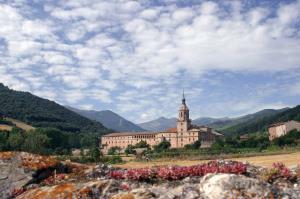 The monastery archives and library are of great value to researchers and is considered to be among the best in Spain. Here the cartularies and three hundred original volumes are conserved. In the exhibition room the replicas of the Romanesque ivories on the caskets are outstanding: reliquaries of San Millán from the 11th c. and of San Felices from the 12th c.
It was built by Benedictine monks, who stayed there until the disendowment and expulsion of the 19th c. Nowadays the Augustine friars are responsible for keeping alive the spirit of the monastery. Don Pedro Manso de Zúñiga, Bishop of the Diocese of Calahorra y La Calzada was the founder of this Abbey. The Cistercian nuns who live here come from the Monastery of Santa María de los Barrios in Abia de las Torres (Palencia), who moved to Santo Domingo de La Calzada in 1610,date when the building of the new monastery began, until the works were completed in 1621. The monastery depended on the Abbey of las Huelgas in Burgos until the bull of Pío IX in 1873, when it was transferred to the jurisdiction of the clergy of the Riojan diocese of Calahorra y La Calzada. The monastery church, a classical work of the architects Matías de Asteazu and Pedro de la Mata, consists of a single nave in the form of a Latin cross, divided into chapels by the flying buttresses in which the altars are mounted. In the main chapel there is a magnificent example of Riojan Baroque art, an altarpiece dating from the middle of the 18th c., in the central niche is the image of Our Lady of the Annunciation. The tomb of the founder, Don Pedro Manso de Zúñiga and his two nephews, also bishops, constitute one of the most interesting artistic elements of the church, situated to the right of the main altarpiece showing the richly worked carving of the recumbent statues of the three bishops. The lower choir situated t the foot of the church served as a cemetery until 1960 and over 200 nuns are buried there. Next to the church is the 17th century cloister which is outstanding for its austerity, in line with Cistercian spirituality. The monastery has free lodging for pilgrims situated in the old Chaplain's House, an 18th century building restored and refurbished to receive pilgrims. Since its foundation it has been inhabited by a community of Cistercians.